The idea for Hush Farms began when Penny and Jon Bond were dealing with their own life challenges. What they found was a woefully inadequate support structure for people affected by major life changes and traumatic experiences. They knew, though, that they could use farming, horsemanship, training and conservation skills to encourage others – providing a fresh outlook on life and supporting personal development. Not long after Hush Farms was set in motion, we all realised that the animals – particularly the horses – have a very great power to change people's lives for the better. It's incredible to see how our visitors respond to the most friendly members of the team – never feeling judged by them, or pressured, but instead gaining more and more confidence with every nuzzle. On the farm, we're also passionate about leaving a legacy, which is why we encourage and enable other farmers and land owners around the UK to adopt similar services to ours. ...and we're quite passionate about a Devonshire cream tea or two as well. 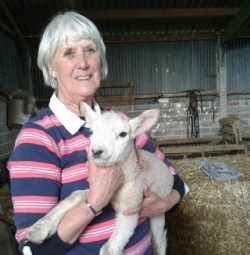 Penny's early years were spent on her family's dairy farm in rural Wales. Previously, she worked as a senior business advisor, facilitating business owners to achieve their ambitions. Penny was one of the first in the world to gain an MBA for Families in Business. Since then she's supported a leading local social enterprise as a non-executive Director, before establishing Hush Farms. Qualifications: MBA; SFEDI (1-8); IOD Directorship (Cert), Lantra Instructor; vocational qualifications include: Equine Assisted Therapy (EAGALA); ATV, Chainsaw, Remote Worker First Aid, Mental Health First Aid, Food & Hygiene Cert, Animal Welfare in Transit. Jon’s career is in farm and countryside management. 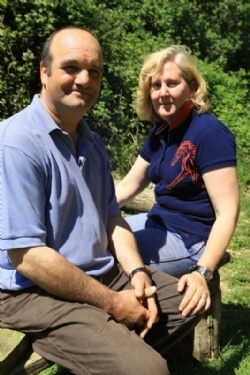 He is a trained college lecturer and was a senior manager at Devon's only remaining agricultural college. In 2004, Jon was selected by the DTI and Devon & Cornwall Enterprise Agency as a volunteer Mentor and Specialist Adviser for rural business. Jon is a qualified land-based instructor and assessor with LANTRA & NPTC, instructing the safe handling of machinery, equipment and livestock. Qualifications: Farm Management; BSc; PGCE; A1; Lantra Instructor; NPTC Assessor; First Aid at Work; REAP; vocational qualifications include: ATV, Spray Operator, Chainsaw and many, many more. Please take the time to read and understand this policy. And bear in mind that by using our website or contacting us by telephone or by email, or providing information to us on our courses or by way of social media, you agree to its terms. By filling in forms, for example when you sign at the start of a course, submitting information via the enquiries form from our website, or a competition. By talking to us on our courses, at events, or over the telephone. For example, when enquiring about a purchase or making a complaint. By registering details, including your names, contact details, details of friends and relatives, your preferences and interests. 'Sensitive' information on you. And by 'sensitive' we mean information such as your racial or ethnic origin, religious beliefs or other beliefs of a similar nature and your physical condition (e.g. if you're pregnant). We ask for a fair amount of this kind of detail in the forms you fill in, and you can choose whether or not you want to provide it. However, we may also acquire it through social media. Full details of the purchases you make. These include the time, date and location of purchase; the services you buy from us; any relevant site address; as well as relevant payment cards such as a credit or debit card, or cheque payment. Any card or other unique identification numbers we may issue to you from time to time, such as your Certificate or Skills card number. Information on what you view, click on and access by way of our marketing emails and text messages (SMS or MMS), and website. Information from banking, credit card and credit reference agencies about your financial status. We also verify any payment card you use when shopping with us to see if it's been reported stolen, to check that we'll be paid for any transaction, and to reduce the risk of fraud (see below). To provide you with information about the most appropriate training services we can offer you (this includes assessments). To help you purchase services from us. For example, we may need to know your credit or debit card details so that we can take payment for the training services and provide you with a receipt. To help us run competitions and special offers and make sure you get all the benefits you're promised. To get feedback from you about our services, website and other services and activities. For example, occasionally we may invite you to review a service you've bought or used from us. To contact you from time to time regarding things you've told us you want to hear about; new training services, for example, or special offers, exciting competitions and sponsored events. If you stop shopping with us or using our services, we may try and encourage you back to us. To respond to any social media posts or other public comments you might make, whether they are directly to us or about us, our services, websites, or other activities. To advertise products or services to you for example on your favourite social media sites (e.g. Facebook and Twitter), or by direct email. Please note that these may be in the form of a link to someone else's website. To make a contract with you. But also to enforce a contract if you don't honour it, including the collection of any debts that we may be owed by you. To gather statistics about how you and other people use our website and what you think of our advertisements, special offers, news, services and course information, competitions, sponsored events, social media and other content and services. We then analyse all this data to see if what we do is interesting to people and meets their needs, or if they should be improved, and if so, what changes would be most beneficial both for our customers and for us. To monitor how people use our website and to see if they are being abused or threatened, for example, by internet trolls posting inappropriate comments in review areas or by would-be hackers looking to undermine our security. Our aim, quite simply, is to interest and excite you as much as possible while providing great service and value to you in everything we do. By knowing more about you, we're able to focus on the things we think are most likely to appeal to you, especially when we send you special offers, news, information on our services and details of competitions and sponsored events. For instance, we can provide you with money-off vouchers and rewards for the things you actually buy from us, and for the things we think you might be interested in buying from us in the future. We can also tailor special offers to the areas where you live or regularly travel to, so when there's a promotion near you that we think you may be interested in, we can let you know. To help us maintain administrative and statutory records about our business so we can better understand what we've sold, and how, when, where and at what price, and pay our taxes. To enable us (and our third-party service providers) to plan and manage our day-to-day business as effectively as possible, for example, to register your completed course results with the relevant awarding body. To help us conduct focused market research based on trends and common factors, so we can further improve the products and services we offer to all our customers. To assist us in the development of new products and services over a period of time. For example, we may need to gauge whether a new product is likely to appeal to a large proportion of our customer base. And if not, we'll want to know why. By matching information that's common to the various sources of information we have about you, we're able to build a bigger, richer picture. So for example, you might enter a competition and provide your email address. You might then register for an online course with us using the same email address. Simply linking those two pieces of information together tells us a lot. And we can achieve the same effect by matching transaction details and technical information about the electronic devices you use. All of which helps us to understand you better and provide a more enjoyable experience for you. Awarding bodies, instructors and/or assessors, and/or hosting venues. Other people who help us provide our website and email services to you. They include information technology experts who design and host our website, and payment services companies that make it easy for you to use your credit or payment cards with us. Other examples include market research companies, marketing, advertising, design and PR organisations and general service companies such as printers, mailing houses and form-scanning service providers. The Police, local authorities, Her Majesty's Revenue and Customs (HMRC), the courts and any other government authority if they ask us to do so (but only if us doing so is lawful). Any social media posts or comments you send to us (on the Morrisons Facebook page, for instance) will be shared under the terms of the relevant social media platform (e.g. Facebook or Twitter) on which they're written and could be made public. Other people, not us, control these platforms. We're not responsible for this kind of sharing. So before you make any remarks or observations about anything, you should review the terms and conditions and privacy policies of the social media platforms you use. That way, you'll understand how they will use your information, what information relating to you they will place in the public domain, and how you can stop them from doing so if you're unhappy about it. It's worth remembering too, that any blog, review or other posts or comments you make about us, our products and services on any of our blogs, reviews or user community services will be shared with all other members of that service and the public at large. You should take extra care to ensure that any comments you make on these services, and on social media in general are fit to be read by the public, and are not offensive, insulting or defamatory. At the end of the day, you are responsible for ensuring that any comments you make comply with any relevant policy on acceptable use of those services. Where it's within our control, we put measures in place to ensure this 'in flight' data is as secure as it possibly can be. We use appropriate procedures and technical security measures (including strict encryption, anonymisation and archiving techniques) to safeguard your information across all our computer systems, networks, websites, offices and training sites. Plus, we use secure means to communicate with you where appropriate, such as 'https' and other security and encryption protocols. If you have any concerns about the security of your own personal computers and mobile devices, we suggest you read the advice of Get Safe Online, which can be accessed here. In most cases, this means we will keep your information for as long as the awarding bodies require us to do so. After that we will either delete it or anonymise it so that it cannot be linked back to you. We provide ways for you to stop all email and text (SMS or MMS) communications you receive from us. Please see the 'unsubscribe' link and 'STOP' details we include in each email and text message respectively. You can also contact us at any time using the details below and let us know exactly what you would like us to change. Whilst we work very hard to make sure mistakes don't happen, we need your help, too. So if you submit an online registration with us, including details sent by email, please ensure that the information you provide (e.g. any contact information) is correct and that you review it and update it regularly. If you have reason to believe any of the information we collect on you may be inaccurate, and you are unable to put it right yourself, please contact us (see below for how to do this). You are perfectly within your rights to ask us whether we hold information about you and if so, for us to give you certain details about that information and/or the information itself. This right is commonly known as a 'subject access request'. Certain exemptions and conditions apply to this right, principally that it should be in writing and that you give us reasonable details about the information you want. We reserve the right not to comply with any enquiries or requests we receive about the information we collect, where we may lawfully do so. For example, if we have reason to believe that a request is malicious, technically impossible, involves disproportionate effort or could be harmful to others. If you have any worries or complaints about the way we use your information, please don't hesitate to get in touch with us. We'll do our very best to set your mind at rest or put things right. And if, for whatever reason, you feel we're not meeting the exceptionally high standards we expect of ourselves, you're within your rights to take your grievance to the UK Information Commissioner's Office (ICO). Please see the section 'Where to go if you want more information about your privacy rights' for further details. Remember that with modern technology, you have more and more personal control over what information we and other organisations collect. Online advertising networks, social media platforms and search engines (Google etc. ), provide tools to manage the data they collect about you, and how it is used and shared. We urge you to look out for these functions and tools and use them to manage your privacy in a way that suits you best. When candidates are under the age of 16 years old, parental/guardian permission shall be obtained, confirming agreement to record, process and share data in accordance with our company policies. We review the ways we use your information regularly. In doing so, we may change what kind of information we collect, how we store it, who we share it with and how we act on it. Whenever we change this policy, rest assured we will make every effort to tell you. That way, you can check to see if you're still happy. And if, following any changes, you continue to use our website, contact us by telephone or otherwise provide information to us (through our stores or social media, for example) we will assume that you agree to those changes. Our full legal name is Hush Farms Ltd.
We're a private limited company incorporated in England and Wales. Our registered company number is07737109 and our registered address can be found in the 'contact us' section below. We are the 'data controller' of the information you provide us with. This term is a legal phrase used to describe the person or entity that controls the way information is used and processed. The Information Commissioner's Office (ICO) regulates data protection and privacy matters in the UK. They make a lot of information accessible to consumers on their website and they ensure that the registered details of all data controllers such as ourselves are available publicly. You can access them here https://ico.org.uk/for-the-public/. You're welcome to get in touch with us to discuss your information at any time. Plus, there are so many others who give a vast amount of their time to keep this train on the tracks, to whom we are tremendously grateful. Learners have the right to complain about training or treatment that they received on our courses. They also have the right to appeal against assessment decisions. 1. All complaints must be in writing and received by the Course Organiser within 14 days of the assessment or incident. 2. The Course Organiser will acknowledge the complaint in writing and contact any relevant Awarding Bodies to inform them that a complaint has been received. 3. The Course Organiser will contact the Trainer or Assessor and ask them to send a report within 5 working days. 4. The Course Organiser will make contact with all parties concerned and plan a way of amicably resolving the complaint. This should be done within 14 working days. 5. If the Course Organiser is not successful with the above procedure, he/she will refer the matter to higher authorities in the Awarding Body (i.e. NPTC or Lantra Awards). 6. The Course Organiser will stay involved with the complaint until the matter is resolved and any decisions or course of actions shall be conveyed to the relevant parties in writing. This could be the Complainant or other members of the course who may be affected by the outcome. 7. Details of the relevant Awarding Bodies will be given to the Complainant should they wish to make their own representation. In some instances, it is possible that the outcome of an appeal may provide evidence to suggest that other learners could have been affected in the same way as the person or organisation making the original appeal. Hush Farms Ltd would take this into account to ensure that, wherever possible, the effects were eliminated. Other learners affected are identified. The failure is corrected where possible. Effects of the failure are mitigated where possible. Action is taken to prevent a re-occurrence. 1. Decisions following the outcome of assessment. 2. Decisions regarding reasonable adjustment and special consideration. All other matters may be addressed through the Hush Farms Ltd complaints procedure. Appeals can be made by instructors, assessors or learners. Where an appeal is made with regards to internal assessment, the appeal must be made to Hush Farms Ltd in the first instance using the centre’s internal appeals procedures. Learners should only appeal to Lantra if the centre’s internal appeals have been exhausted. Where an appeal relates to the result of an assessment that is set and marked by Lantra, the appeal can be made direct to Lantra. Appeals must be made within 3 calendar months of the date of the event that the appeal relates to, e.g. date of test or course. All appeals must be submitted to The Course Organiser of Hush Farms Ltd. The appeal must be made on the Appeal Form (available on request). Where the appeal is against the outcome of assessment there is a cost per learner appealing to cover administration and re-marking costs, however if the appeal is upheld this fee will be reimbursed. Stage 1: On receipt of an appeal and supporting documentation this information will be reviewed. Other parties may be contacted for further information where necessary, for example assessors, verifiers or examiners. Hush Farms Ltd will make every effort to resolve any appeal quickly and will make at least an initial response and acknowledge receipt of an appeal within 5 working days. Following receipt of an appeal, Hush Farms Ltd aims to move to ‘Stage 2’ within 10 working days. Stage 2: The appeal will be looked at in depth by the Course Organiser/Managing Director of Hush Farms Ltd to decide the outcome within a further 10 working days. This stage may be conducted via telephone, email or other appropriate form of communication. Should Hush Farms Ltd be unable to reach a decision the appeal will be forwarded to the appropriate Awarding Body for further consideration and resolve. The person making the appeal may make verbal or written representation to Hush Farms Ltd if they wish. Legal representatives for any party will not be allowed to attend. The decision of the Awarding Body is final. Following the decision, the person or organisation making the appeal will be notified in writing of the outcome within 5 working days. Where the appeal or a complaint is in relation to an Ofqual or SQA recognised qualification, an appeal or complaint can be made to the appropriate regulatory authority (Ofqual in England, Wales and Northern Ireland, or SQA in Scotland). It is recommended that any appeal or complaint to the regulators should only be made when an individual has followed all appeal procedures of Hush Farms Ltd and Awarding Bodies first. For example, if it is shown that a test paper was incorrectly marked, the work of the examiner(s) involved would be reviewed to ensure that other learners were not affected. If similar errors were discovered, Hush Farms Ltd would ensure a re-mark of all the relevant test papers and, where necessary, issue fresh results to any learners affected. Appeals received are monitored in order to identify whether any patterns or trends exist.